The spectacular new features & functions. Now available with Loopy Loyalty! Select a digital loyalty card type that's right for your business. 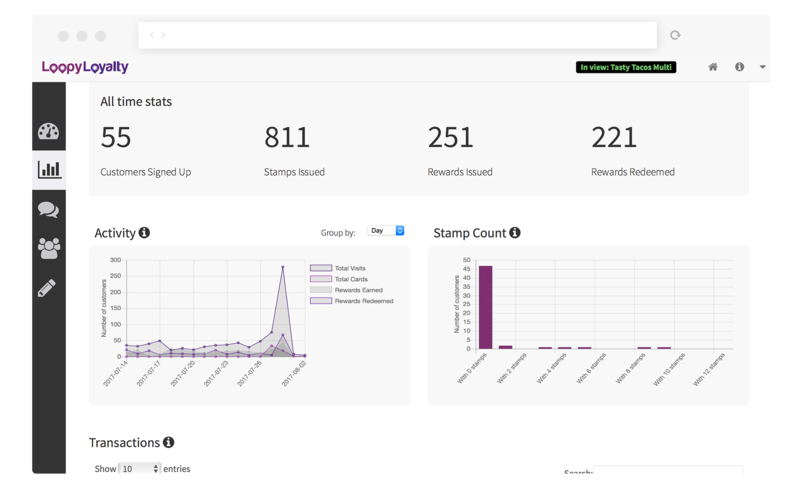 Whether you want to reward your customers after collecting all stamps or provide multiple rewards as they collect more stamps, Loopy Loyalty makes it easy for you to get up and running. You're no longer constrained to selecting either 8, 10, or 12 stamps. Now, you can select any quantity of stamps (up to 30) that suits your business needs. Use the WYSIWYG designer tool to design and preview your digital stamp card in both Apple Wallet & Google Pay. All digital stamp cards are automatically enabled to support Apple Wallet (global) and Google Pay (17+ countries). What if Google Pay is not available in my country? Whether you want to send a promotional message to everyone, invite your customers to an upcoming event, or simply thank a single customer, you can do it all in just a few clicks. Give your customers stamps & rewards wherever your customers are in the world - no need to physically scan their digital stamp card! This is perfect for businesses in eCommerce, those that don't see customers face to face, or if you simply want to surprise your customers with a stamp! Measure the true ROI of your digital loyalty program with valuable insights from day one. See how many customers have joined your loyalty program, how many stamps you've given out over time, how many rewards have been redeemed, and much more. You'll also have access to a list of events & transactions in real-time. From when a customer enrolls to when stamps have been issued, Loopy Loyalty provides you with a full audit trail so that no stamp or reward is left unaccounted for. For those that are concerned about data accuracy & integrity, you'll be happy to know that Loopy Loyalty records every transaction using blockchain technology. Get to know your customers a little bit more by collecting information upon signup. Greet your customers by name, send them a nice message on their birthday, and build a relationship with each customer in order to accelerate customer loyalty. Where will customer information be stored? 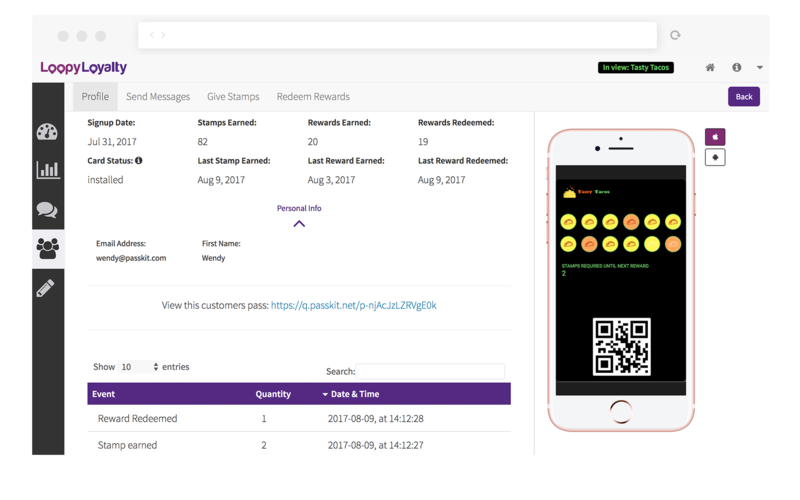 Deep dive into each customer's profile and see their full transaction history, when they signed up, how many stamps they've earned, messages you've sent them, when their last visit was, and more. For example, send them a message if they haven't visited in over a month. Know that their birthday is coming up? Give them an extra stamp! Explore the Loopy Loyalty plans. We know it can seem scary creating and managing your digital loyalty programs. That's why we've put together a wealth of resources (videos, articles, samples) so that you have everything you need to get started with confidence. Access live chat 24/7 from inside your Loopy Loyalty account. Our team is available to provide you with support and guidance when you need it the most. We promise we're not robots 😃 . Take 10 minutes to create a digital stamp card and make the most out of Loopy Loyalty today.